The property has been built using the colours and style of Portuguese colonial architecture, with a single central courtyard, typical of the colonial past, overlooked by romantic wooden balconies. It consists of only a few clean elegant apartments and stylish reception, cafe and bar. The bathroom has undergone a recent refurbishment to bring it up to date and give it a clean modern look. Credit Cards in Cape Verde: Mastercard is not usually accepted in Cape Verde, so bring Visa debit card and Euros. The property is a unique colonial style building which has a wonderful rustic charm. It is a quiet location, but close to all amenities. This apartment offers a fantastic roof terrace that has great views of the sea, Estoril beach and also Sal Rei. The terrace is exceptionally large and fully private. It is the perfect place to relax, sun bathe or watch sunsets from. toilet, shower, The bathroom has recently undergone a refurbishment. Portable wifi available @ €35 per week including data usage. There are plates, dishes and utensils in the apartment for 4 people. The kitchen and dining area can seat 4 people, there is an electric oven and gas hob, washing up area, and drawers and a cupboard for the storage of crockery, cutlery, pans Etc. A selection of books are available in several different languages. The bedroom has a romantic wooden balcony, the highest point around and therefore wide views. Facing south-west, ideal for watching the sun setting over the sea. Large private terrace, with sea views, 4 large sofas, pergola sunshade, 2 sunbeds, outside table and chairs etc. This is fantastic living space. The apartment is situated on the 4th floor which is only accessible via a staircase. The apartment is suitable for couples or for families. Large private terrace, with sea views, 4 large sofas, pergola sunshade, 2 sunbeds, outside table and chairs etc. This is fantastic living space. The bedroom has a romantic wooden balcony, the highest point around and therefore wide views. Facing south-west, ideal for watching the sun setting over the sea. Linen and towels (not beach towels) provided. Changed weekly. The penthouse is cleaned weekly. Extra cleaning & laundry can be supplied by arrangement. There is a a small cafe / bar at Casa Velha. Not suitable for disabled or the elderly, due to stairs. Loved the Island and the location of the house couldn't fault it that was perfect. The house had plenty of room for 2 people but.. it is in need of a revamp paint falling off walls and floors the bathroom was very grubby. We were given a phone by Kerry which we thought was a great idea, but unfortunately when we tried to use it to report the broken fan plug and sofa we found that it didn't work. Also the curtains around the outside sofas (which are in the picture) just weren't there so no shade to be found on what was an amazing terrace. We didn't let these little issues spoil our holiday the beach was wonderful you could swim in the sea and the beach bars nearby were very good. These holidaymakers did not receive the usual high standard that most of our guests receive. This was due to a combination of the temporary abscence of our concierge (a new baby! ), an emergency water leak in the shower room, unexpected rain, and serious illness. Scheduled maintenance takes place at this time of year, so minor problems do get fixed. Casa Velha is a large, shutter clad property, colonial in style and comprising maybe half a dozen self contained apartments. We were staying in the top floor penthouse, a fabulous one bedroomed property with extensive outside balconies and terraces. The apartment was furnished in the IKEA style, had an open plan kitchen/living area and on this floor was also the small bathroom. Upstairs was the single bedroom which had french windows and glorious beach/sea views from the bed which was our 6am vantage point as the sun rose. The owners claim the property would sleep 4 but that would rely on 2 sleeping on the sofas in the living area which might not be ideal. The kitchen was well appointed-fridge with small freezer, kettle, toaster, gas hob and oven. The cupboards were perhaps short of cooking essentials such as a colander, bread knife and large lidded saucepan, otherwise it was clean and well appointed. The bathroom was beginning to show it's age but I believe this is soon to be remodelled which will be a big improvement. It also housed the only loo in the property which was a chore if you needed to pay a visit from the upstairs bedroom during the night. The bedroom was a good size with wardrobes and table lamps. The views were simply amazing, to lay on your bed and have an uninterrupted view of a giant sun setting is a joy to behold. The terraces were also outstanding, 4 large sofas, a couple of loungers and a small dining table and chairs, it was perfectly possible to live outside! Accessing the apartment could be challenging if you have young children or mobility problems-it's a climb of 60 odd steps up fairly steep flights of stairs. The beach was a five minute walk away, the town similar. There's a small minimart for groceries and household essentials. We were a little surprised that food shopping and eating in restaurants was similarly prices to the UK, how the locals get on I don't know. The local beach bars are good, Alisios particularly so, we ate out a few times and the food was ok but not the abundance of fresh fish we were expecting. We will certainly return to this African odyssey and this property in particular. The shower room has had a complete refurbishment (Feb 2016) - shortly after these guests left. Most guests are couples, although the sofa beds are useful for families. The local currency has an exchange rate fixed to the Euro, so prices can vary. Generally we find them to be about two thirds of UK prices. Fresh fish is VERY cheap when bought at the fish market, but fruit & veg is similar to the UK. For us it was an experiance to travle to the Capo Verd and specially to Boa Vista. The Penthouse Apartment is place to relax and enjoy the sun rise and set. The space inside and outside at the terrace is beautyful. The sleeping room on top of the appartment give´s an Idea of a perfect holiday. It is a quiet property and the surroundings also too. If you like you can choose the have your breakfast down stairs in the little Bistro in the property, or walk agross to the next bakery of your joice and have a relaxing start into a beautyful day. This Penthouse Apartment was a recomondation from friends of my. They have been to this lovely place serveral times. Our second stay at this penthouse on Boa Vista was again a very nice time during our holidays in Cabo Verde. A warm and well-organised welcome by Matthew; the flat ready for us and clean; an immediate feeling of relaxation and enjoyment. Yes, we recommend this place: a flat with a real holiday flavour, a huge terrace with furniture, close to the beach, close to Sal Rei but where you can be on your own. The Penthouse Apartment is perfectly situated near to all the action - beaches, restaurants and shops. It is fully furnished with all the necessary kitchenware, bedding, etc., and has a lovely terrace for sunny breakfasts, romantic evenings (beautiful sunsets, soft lighting, comfy sofas) and sunbathing/relaxing. The property is very well maintained and is cared for by a dedicated team of staff on the ground floor of the apartment building - where there is also a restaurant/bar and internet facilities, as well as good advice about holiday activities, local restaurants, etc. Stylish home from home in paradise! What's not to love about this place, this island and it's beautiful people? We've been to Boa Vista 4 times now, in 2 years, just returned. 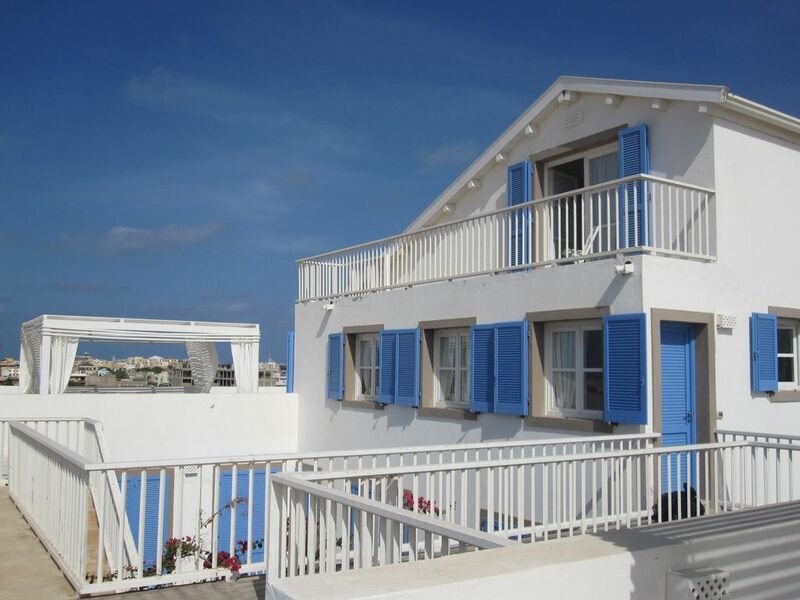 Casa Velha, located a stone's throw from the stunning Estoril and Chaves Beaches with their smattering of laid back beach bars and cool surfer dudes, is always our first choice in Boa Vista. We are welcomed like old friends to this elegant place, beautifully designed and staffed by the loveliest people. They work hard to make your stay perfect, whether it's mixing a killer cocktail (Otaldina you know what I am talking about! ), arranging an activity or making a dinner recommendation, nothing's too much. And smiles all the way! Locally try Alisios for GREAT food, wild Mojito's and the coolest staff in Sal Rei. Marcos, Victor and Ailine rock!! Ca Luisa does fantastic pizza...the best outside of Napoli! Morebeza has a great vibe, and great tunes, set in the dunes. And Blu Marlin in the Praca has the best fish served simply. If you can, pass on the big all inclusives and stay at Casa Velha. It's a gateway to a different kind of experience. You get to slip behind the scenes of Boa Vista, meet locals and make new friends. It's a privilege to come home from a holiday and feel a sense of belonging and affinity with the island, it's beautiful warm people, and that there's a great place to stay at the end of each day. Leaving is hard but made easier, so much easier, knowing we will be making trip #5 later this year...Back to The Penthouse. Less than 10 mins drive from Boa Vista International Airport (BVC). We arrange for airport transfer to/from Casa Velha in advance. Car hire is not necessary. Please contact us if you need help in finding flights - we can provide details of how you can usually reduce the cost of flights from the UK. Prices are for the property per week, based on 2 guests. Extra charge of GBP 35 per week per additional guest. Airport transfer on arrival costs EUR 20 in total, payable to our concierge in BoaVista. Breakfast available, but not included in price. 25% deposit required. Balance due 60 days before stay commences.